It’s time for another new release from Ellen Hutson – more Mondo flowers by Julie! So excited, I just love her giant flowers – they’re so easy to get into the coloring! Links to all the coffee-themed and Bearware stamps and dies are in the list at the end of this post! The ink pad used in this project is an old tan dye ink pad by a company that no longer exists – it takes about 8 stampings to get it to show up, but I can’t seem to pitch it yet! 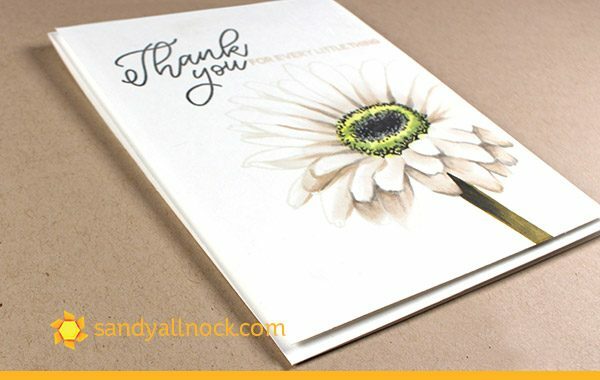 I kept the design simple – just popped up with a little dimensional adhesive onto a white card base! The prizes were mailed out yesterday to the winners…congratulations! Such a lovely and sophisticated card! Congrats to Lori and Betty!!! When I see the finished piece and then see how you colored it step by step, I’m always amazed at how you layer. When you started the coloring of this gerbera I thought, really, but ends up a white daisy. But she’s using dark colors! And, it looked messy for a while and I didn’t know how that was going to change into the lovely finished project. I learn a lot when I watch you color. I don’t know why dark colors freak me out. And congrats to the lucky winners! Freaking amazing. I love when you “color” flowers in whites. 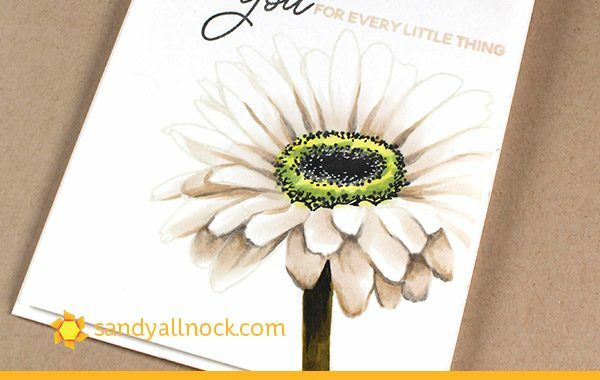 Wow – that beautiful Mondo Gerbera Daisy, and a wow to your “simple” design and neutral colors that showcase it beautifully! 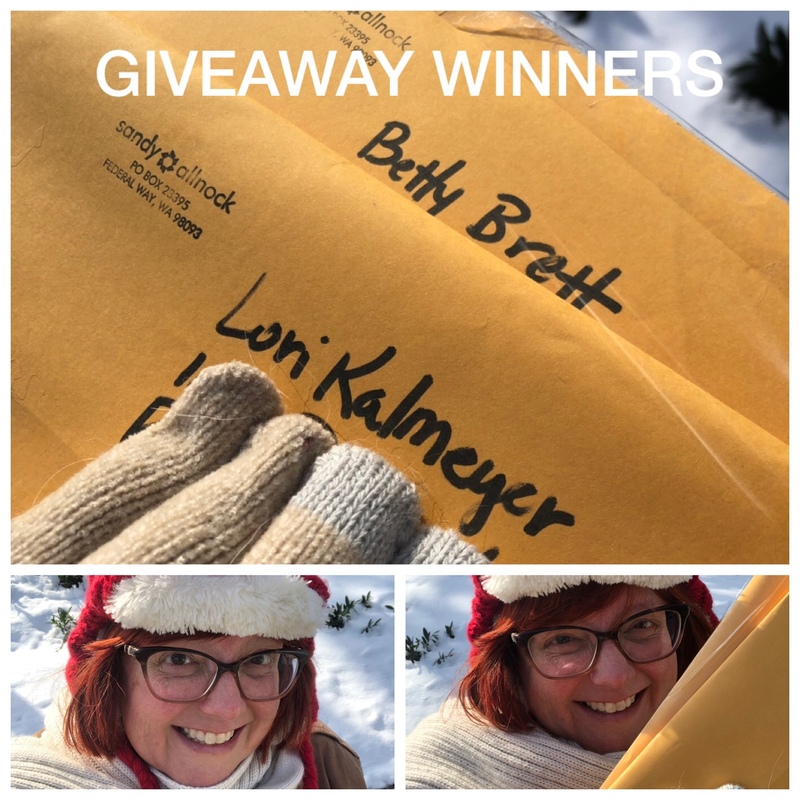 Congratulations Lori and Betty, enjoy your prize! It’s gorgeous Sandy, love the card as well as the colouring of the flower.Thank you so much for showing. 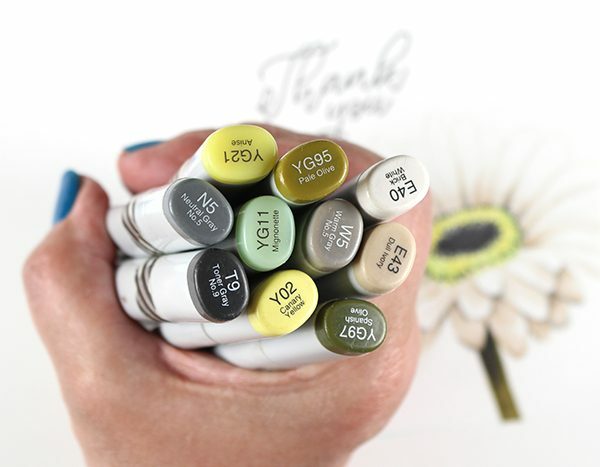 If you have white things to colour, such as the flower you did,and you want to use shades of gray instead of brown shades. Would you then use cold or warm grays? I love the look of that daisy! Awesome coloring! Sandy, I mentioned this in a comment after watching today’s video but wasn’t sure when you might see it so I’ll mention it here, as well. 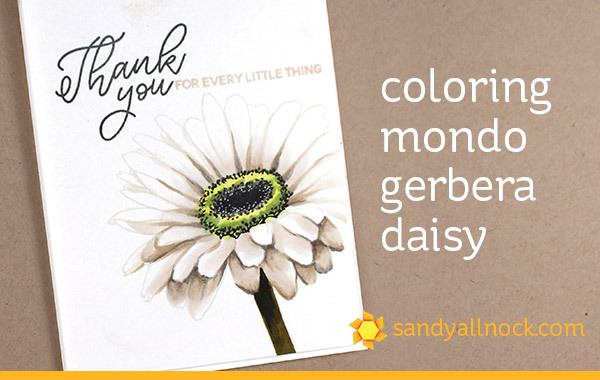 Stampin’ Up sells an ink color called Sahara Sand that looks very similar to the ink you used to stamp the daisy. I don’t know, though, if you can purchase their products directly online or if you need to go through one of their demonstrators. I hope this is helpful. Gorgeous colouring, Sandy, and congrats to the lucky winners! Looks like it’s really cold over there. Do stay warm … and safe! Outstanding use of neutrals with a pop of cheerful like green! It’s amazing, Sandy! Julie’s images are awesome, too! Congratulations winners!! !